A rookie NYPD detective is assigned to the Vigilante Unit, and must investigate a case where the husband is the suspect of killing the assassins of his wife and daughter. 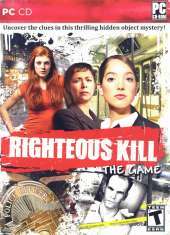 Righteous Kill is a hidden object game tied to a movie license, in the same way that Blood Ties, created by the same developers, was connected to a TV series. The gameplay mechanics follow the standards of the genre: objects listed at the left side must be located and retrieved from the screen within a time limit. A UV flashlight button is the hint system, when pressed it highlights the location of an object. There's no limit to its use, but after being activated the flashlight takes some seconds to recharge. Several mini-games appear between the stages, where the player must dust objects to retrieve fingerprints, reassemble torn documents and click on the difference between two scenes from a security camera.